Image credit: Chennu et al. Scientists in Cambridge have found hidden signatures in the brains of people in a vegetative state, which point to networks that could support consciousness even when a patient appears to be unconscious and unresponsive. The study, funded mainly by the Wellcome Trust, the National Institute of Health Research and the Medical Research Council (MRC), could help doctors identify patients who are aware despite being unable to communicate. Now, a team of researchers led by neuroscientists at the University of Cambridge and the MRC Cognition and Brain Sciences Unit, Cambridge, have used high-density electroencephalographs (EEG) and a branch of mathematics known as ‘graph theory’ to study networks of activity in the brains of 32 patients diagnosed as vegetative and minimally conscious and compare them to healthy adults. The findings of the research are published today in the journal PLO S Computational Biology. 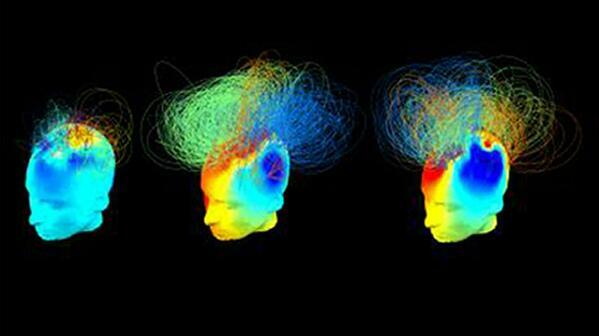 The findings could help researchers develop a relatively simple way of identifying which patients might be aware whilst in a vegetative state. Unlike the ‘tennis test’, which can be a difficult task for patients and requires expensive and often unavailable fMRI scanners, this new techniqu e uses EEG and could therefore be administered at a patient’s bedside. However, the tennis test is stronger evidence that the patient is indeed conscious, to the extent that they can follow commands using their thoughts. The researchers believe that a combination of such tests could help improve accuracy in the prognosis for a patient.